The First Amendment is just one of the many complex issues that the Nov. 9 Missouri protest gives us the opportunity to talk about. Photo by Brian Turner on Flickr and reused here with Creative Commons license. The viral video depicting confrontation between protesters and journalists at the University of Missouri has become a hot topic of discussion in college classrooms nationwide. "The lesson of this case is that polarized and politicized interpretations of the First Amendment, which are based on rushes to judgment and lack of attention to the gray areas of law, are not what we should strive for in our complex society." 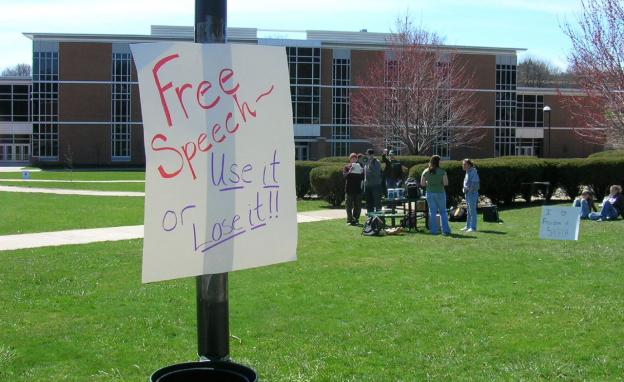 Commentators and pundits have labeled this incident an attack on freedom of the press, or even yet another example of overly liberal and overly sensitive college students and professors besmirching the First Amendment. But the First Amendment parameters governing the events depicted in the MU video are more complicated than they seem. To prevent this incident from polarizing classrooms on the place of the First Amendment on college campuses, educators must understand the incident’s unique legal complexities. Screenshot via Mark Schierbecker, YouTube. Because the incident has been labeled an attack on the freedom of the press, let’s begin from the opposing side and ask the following question: What limits legitimately could have been placed on the journalists in this incident? MU’s Carnahan Quad is a traditional public forum, meaning anyone can access it and use the space as a platform from which to speak a message. Courts also have consistently held that anyone, journalist or not, has a right to gather information in such public places. Could the protesters limit the journalists’ rights by claiming a reasonable expectation of privacy in the public space that they were occupying? It’s not very likely. Courts have consistently held that in a public place, journalists can take photographs of people, even without their consent. A reasonable expectation of privacy shields the subjects of photographs in public places only in very specific contexts. For example, the Massachusetts State Supreme Court held in 2014 that a woman may have a reasonable expectation that her privacy won’t be violated by someone using his cell phone to take a photo up her skirt on a public train. However, the protesters almost certainly had a reasonable expectation of privacy inside their tents. Protesters dwelling within these nylon walls could refuse access to anyone, journalist or not, and they probably would have a claim for invasion of privacy via intrusion if the unwanted passersby entered the tent without consent. So we can pretty safely conclude that the First Amendment right of journalists to gather information on the open grounds of Carnahan Quad was much stronger than any perceived right of privacy claimed by the protesters. If the affected MU journalists (Tim Tai and Mark Schierbecker) felt so inclined, they could bring a so-called “Section 1983” lawsuit against the university. Such a suit (named after the section of the United States Code that allows it, 42 U.S.C. § 1983) alleges that a government entity has unjustifiably deprived a person of the “rights, privileges, or immunities secured by the Constitution.” Public universities are, in fact, government entities. The journalists’ ability to prevail in this claim hinges on the role of the university officials that took part in the human wall. The journalists would have to prove that these officials acted as agents of government rather than as private individuals. The U.S. Supreme Court has not declared that government employees enjoy an “On-Off” switch to delineate when they are speaking as private citizens and when they are speaking as agents of government. However, the Court has only dealt with this issue in the context of cases where public employees were fired for things they said either inside or outside of the workplace. Therefore, the door does not appear shut for university officials to argue that they were not acting as agents of the university during the protest, especially given that they were acting as members of a crowd made up predominantly of students (i.e., not university officials). If the journalists do succeed in proving the university officials acted as agents of the university, one conceivable defense the university could put up is that the human wall, itself, was protected speech. The protesters had a clear message: “We consider this space a sanctuary, and we wish to protect it.” They expressed this message in three ways: by written signs, by verbal expression, and by forming the human wall. 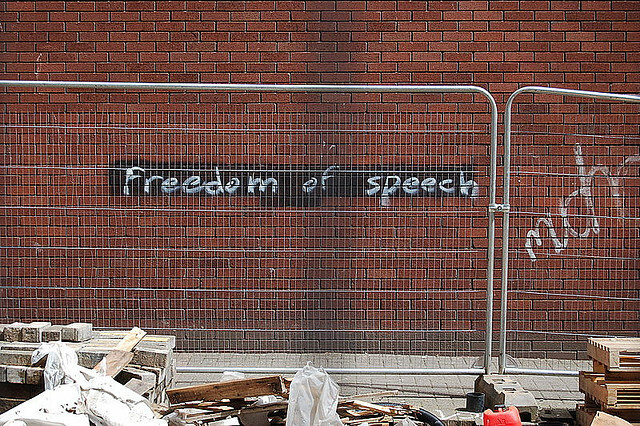 The First Amendment almost certainly protects the first two means of expressing this message. It is less clear whether the human wall enjoys the same protection. The wall could be considered “conduct” rather than “speech,” and the Supreme Court has consistently said that conduct does not receive First Amendment protection. However, courts are not called upon to distinguish speech from conduct. Rather, they are asked whether a specific law banning a certain type of conduct unconstitutionally infringed on the message associated with the conduct. For example, a divided U.S. Supreme Court held in 1989 that a Texas law that criminalized flag burning was unconstitutional because it discriminated against the message conveyed by burning the flag in favor of the message that the flag should be preserved as a symbol of national unity. Educators often interpret this case as holding that flag burning has First Amendment protection. A more accurate interpretation is that laws prohibiting flag burning are unconstitutional. Photo by Walt Jabsco on Flickr and reused here with Creative Commons license. In the Missouri incident, no one was arrested and charged with violating any law. If the university were to argue the human wall was protected speech, thereby immunizing them from the Section 1983 claim, they would be in uncharted territory. Ultimately, this incident would have benefited from the presence of a neutral, third-party authority (such as campus police or campus security officials) stepping in to make an on-the-spot judgment of whose First Amendment rights trumped whose. However, based on the foregoing analysis of this incident, it is understandable such a judgment would be no piece of cake. Although the facts and the law seem to point to a clear win for the journalists here, this case brings up more “probablys” and “almosts” than certainties. Indeed, a lot of law is like that. The lesson of this case is that polarized and politicized interpretations of the First Amendment, which are based on rushes to judgment and lack of attention to the gray areas of law, are not what we should strive for in our complex society. One final “probably”: the incident that punctuated the video (the professor calling for “muscle” to get Schierbecker removed from a public space) was probably not protected speech. Schierbecker could file a criminal complaint against the professor for making a true threat against him under Missouri Statute 574.010(1)(c). But should he? As gray as the law can be, ethical decision making is many times more gray. In the interest of not polarizing the situation any further, perhaps he should not. Brett G. Johnson is an assistant professor of journalism studies at the University of Missouri School of Journalism. His research involves First Amendment theory, public opinion of extreme speech, and extra-legal means of governing extreme speech in public places and on social networking sites.